It was a case of survival of the fittest on the final day of racing at the Extreme Sailing Series Cardiff presented by Land Rover, that demanded all of each crews' strength and skill to avoid collisions and capsizes. 60,000 spectators lined the shore over three days, to watch first hand as the teams were battered with a solid 22 knots with gusts of up to 30 for the fourth day of racing. Experience paid off and Leigh McMillan, with double Olympic gold medallist tactician Sarah Ayton and the team on The Wave, Muscat, stormed into the lead, putting the Omani team back on top of the leaderboard for the 2015 Series. 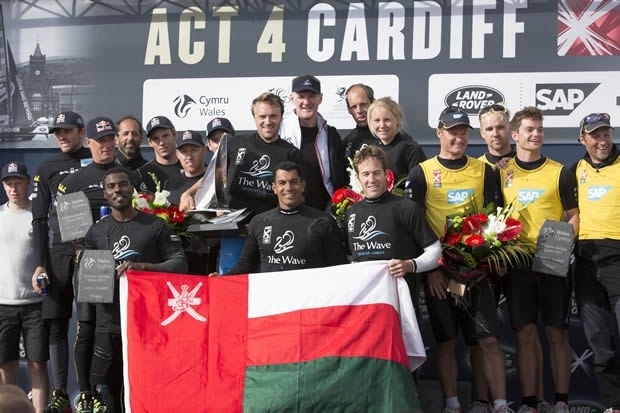 The Wave, Muscat, took control in the wild conditions, posting five podium finishes on the final day and more podiums over the 32 race event than any other team. With an eye always on the leaderboard, the final double points race of the day became a tactical game from start to finish, the team match racing SAP Extreme Sailing Team down the pack. The battle for second place was intense between the Austrian Red Bull Sailing Team and the Danish SAP Extreme Sailing Team, which went into the final race tied on points – a simple case of who wins, wins. Red Bull Sailing Team was on fire all day scoring an impressive four race wins and a third in the final race of the day earning the Austrians second place. With regular skipper Roman Hagara coaching the team from the support RIB throughout the week due to a shoulder injury, helm Jason Waterhouse and skipper Hans Peter Steinacher clearly relished the conditions that were, at times, on the edge of control. The team even managed to pull back from the brink of a near capsize, to claim an incredible race win. Awarded the Land Rover Above and Beyond Award for teamwork and performance under pressure this week, and for securing their best result so far this year, GAC Pindar, co-skippered on this occasion by Chris Draper and Seve Jarvin, just missed out on the podium despite consistently putting pressure on the top teams. Physically tough, the conditions took their toll on the boats as well as the crews over the four days. Oman Air finished the regatta in sixth after winning the final double points race with a convincing lead, but was unable to recover four races she missed after her winch pulled clean off the deck yesterday. Lino Sonego Team Italia and Team Turx powered by Kaya Ropes also suffered deck gear problems and despite both posting podium positions over the weekend, neither couldn’t find the consistency to compete with the more experienced crews. At the halfway mark of the 2015 Extreme Sailing Series just three points separate the top three boats, with The Wave, Muscat now leading the charge one point ahead of second place SAP Extreme Sailing Team with Red Bull Sailing Team in third. Next stop is a brand new venue for the ESS, Hamburg, Germany over 23-26 July.